What Are the Benefits Of Five Axis CNC Machining? Five Axis CNC Machining and the machines are amazing to work with, they are sophisticated CNC machines that can improve your bottom line. CNC programmers are working with 5 axis CNC machines more often now than a decade ago because of the realized benefits associated with the machines. 5-axis machines can be intimidating because they are more complex than your regular VMC or HMC, but there are many benefits to having one. If you currently process parts on a VMC or HMC without 5-axis capabilities you are creating more machine set-ups to process work pieces. However, 5-axis machines have some limitations compared to a 3-axis VMC or HMC. A couple example of the limitations are the limited work holding devices, such as vices on the market or the use of large pallets due to the table size. But with some ingenuity, those limitations can be reduced or overcome with fixture designs centered around the type of work and 5-axis machine. 5-axis machines process work with more accuracy, efficiently and are cost effective processing beasts. The work piece quality increases because there is less error due to operator handling and the stack up of error due to re-fixturing a work piece in multiple operations is nearly eliminated. The geometry of the work piece will have greater positional accuracy because the features from different planes and geometric positions will be completed in a single cycle and work holding. Eliminating waste through set-up reduction is a benefit from machining parts on multiple sides or even complete depending on the fixturing type, machine, and work piece geometry. In 3 plus 2 machining, you can process multiple features from different positions utilizing the tilt axis and rotary axis, rather than processing a work piece in different operations and work holding situations. Machining on 5-axis machines can lower the cost of tooling, increase processing speeds and create better finishes. Because you can change the angle of the work piece to reach geometry allowing you to choke up on tooling, that would have to be held with a greater length to diameter ratio, processing the features on a 3-axis machine. You will also be able to reduce cycle times in certain applications because of the ability to cut with the side of the tool instead of using a ball nose end mill to process faceted or tapered surfaces. One of the greatest benefits of 5-axis machining is the ability to machine work pieces at complicated angles and positions that would be very hard or impossible to achieve with a 3-axis machine. 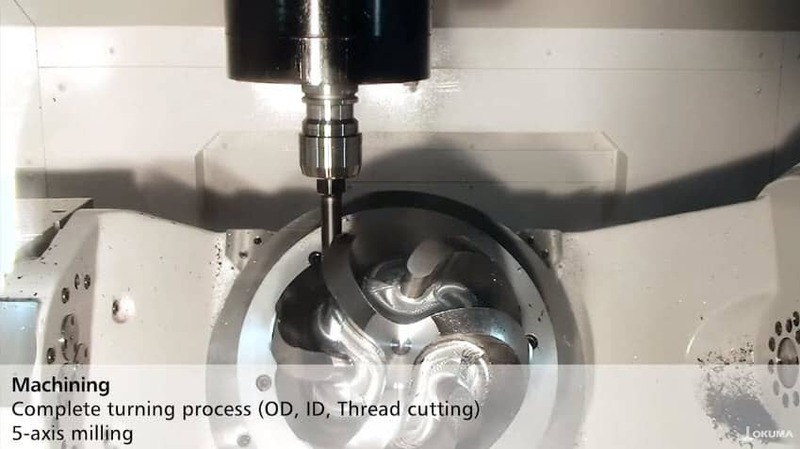 Simultaneous 5-axis machining is the shining light of 5-axis machines because you can perform work that is impossible to perform on a 3-axis machine. Once you start using the 5-axis machine whether it is for 3 plus 2 positioning or simultaneous 5-axis machining, you will encounter new solutions to the challenges faced with the limitations of 3-axis machines. It can be argued that set up time is less when using a 5-axis machine to process parts, but it really depends on the experience of the operator and CNC programmer. Having more axis capability and generally more tool holding capacity means, taking a job that was previously processed with multiple set-ups and squeezing it into one set up. That means while you have minimal work holding situations, you may still have just as many tools machining all the different features that would be processed in multiple operations. The difficulty is the learning curve and time involved trouble shooting when an issue pops up. On a 3-axis machine, the setup is pretty straight forward and easy to trouble shoot when things don’t go as planned. However, when a work piece doesn’t meet specifications on a 5-axis machine it is more involved when it comes to trouble shooting the issue. The feedback I have given many operators iis to make sure you perform checks for parallelism, perpendicularity, and concentricity during the changeover. 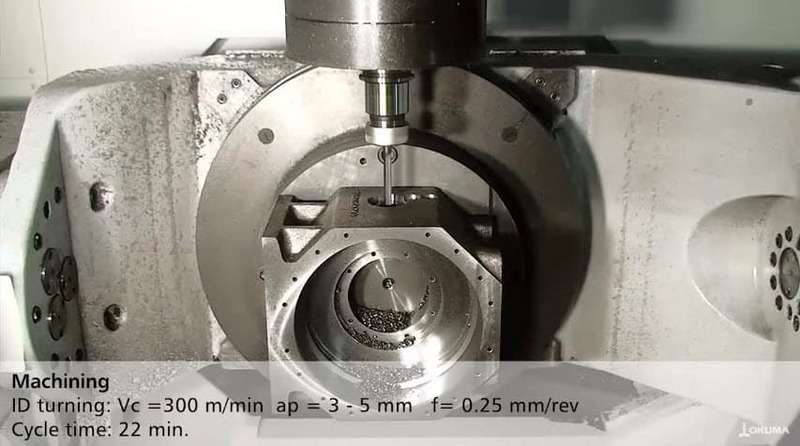 Much like indicating a vice on the table of a 3-axis machine, you want precision within the setup. Most of the issues that come up in 5-axis machining tend to come from eccentricities within the set-up. Like a fixture, collet chuck or vice being out of position physically or through offset register values being incorrect. When processing work about a center line with rotation being eccentric a couple of tenths equals a few tenths during the rotations and machining of the work piece. When trouble shooting look at each machines axis and its relation to the work holding. Work your way from where the fixturing is attached, eliminating the possible variables to the issue on through to the work piece. After you get your feet wet a few times the change over time will become less daunting. Then you will see the reduce set up times associated with processing work in a single set up on a 5-axis machine. There are many benefits to processing work on a 5-axis machine. After you have overcome the initial learning curve, you will reap the benefits of reduced cycle times, reduced set up times, greater flexibility and quality with processing your work. Here’s an example of 5 axis machining and the complexity in parts that it can create.